Character designs on textured paper. Five characters in artic-style costume. 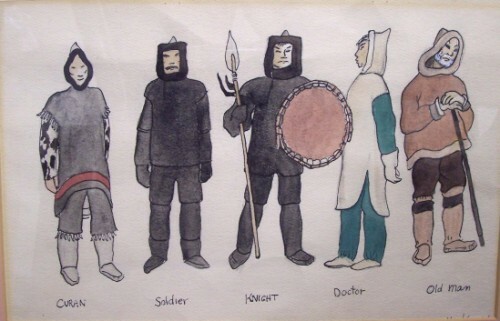 “Curan,” “Soldier” and “Knight” in black (Knight also carrying spear and drum), “Doctor” in green in white, and “Old Man” in brown tones with walking stick. Inscription by Herbert Whittaker on verso. Pink board with black frame. Artist’s signature hidden by framing.